At their recent Windows 10 event, Microsoft announced a new line of devices and software features that they hope will change the way we interact with technology. The company answered many of the complaints users had with previous products: they’ve rebooted visual displays in Windows 10, and they’ve finally put Internet Explorer out of its misery. But perhaps the most exciting news was that Microsoft plans to finally offer a truly holistic user experience across all devices. Indeed, Windows 10 is the operating system we’ve been waiting for – it now works seamlessly on both PCs and smartphones, incorporating features that can keep up with our increasingly mobile lives. Better synchronization will allow users to access messages and other application notifications on all devices. Additionally, Cortana, the voice command assistant once exclusive to Microsoft smartphones, will now be accessible on PCs. And applications like Microsoft Office and OneDrive have been reformatted to fit the screens of mobile devices, tablets, and PCs alike. When we say an integration of all devices, we really mean it. A new Xbox app will integrate Xbox One data like messages, friends, and activity feeds into other devices, so all information is accessible – anywhere, anytime. This feature also offers streaming capabilities, offering gamers more options than ever before. Gamers can also look forward to Microsoft’s new virtual reality headset, the Microsoft HoloLens. This headset is nothing like the bulky Oculus Rift, which as of now has essentially dominated the virtual reality market. 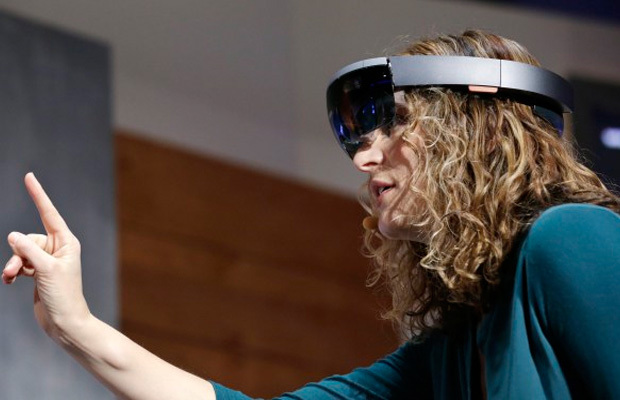 The HoloLens projects holographic images onto a see-through visor, thus incorporating virtual content into real-world settings. ‘Touchscreen’ was another buzzword at the Microsoft event, with the introduction of a massive touchscreen television (84 inches, to be exact), and the announcement of Continuum, a feature that helps devices transition smoothly from keyboard to tablet usage. Windows 10 has also been updated with a layout that’s fully compatible with touchscreen devices, offering a full-screen start menu and re-imagined desktop icons. Finally, those who have stood by Microsoft from the start must say their final goodbyes to good ole’ Internet Explorer. Project Spartan will fill its shoes, offering a number of exciting features like “note taking mode,” “reading mode,” and built-in Cortana technology. It looks like Microsoft has completely re-envisioned their product line, and we’re eager to test out the devices ourselves. Of course, everything cooperated nicely on stage, but only time will tell if these new changes will truly influence the tech sphere.